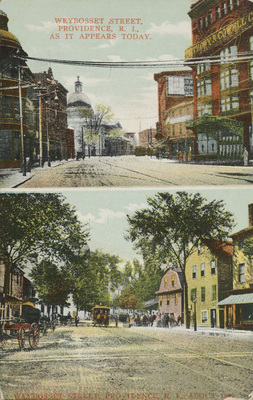 "Weybosset Street, Providence, R. I., As It Appears Today. Weybosset St" by J. H. & C. H. Seddon, Prov., R.I.
Weybosset Street, Providence, R. I., As It Appears Today. Weybosset Street, Providence, R. I. About 1860. J. H. & C. H. Seddon, Prov., R.I., "Weybosset Street, Providence, R. I., As It Appears Today. Weybosset Street, Providence, R. I. About 1860." (1915). Rhode Island Postcards. 311.